Prayaana is the first of its kind EMPLOYABILITY, ENTERPRENEURSHIP and INNOVATION lab for women in Kerala. Sree Buddha College of Engineering is a part of it and encourages women to actively participate in various venture of prayaana related to women empowerment.We have a group of students who are members of prayaana, they are trained and molded Kerala. The prayaana fellows of SBCE have shown excellent performance in all the activities of pryaana bringing name and fame to the institution. 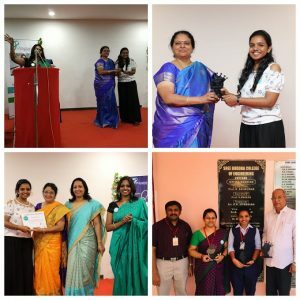 As a part of Women’s day celebration “career Queen Summit 2019” Sree Buddha College of Engineering received three awards. (i) Campus with highest number of Social impact stories. (ii) Hub with highest number of Prayaana fellows in 2018. (iii) The best ambassador-Ms.Sruthi.S of final year Electronics and communication department. It was a great opportunity to receive it from none other than Dr Tessy Thomas, “The missile woman of India”.